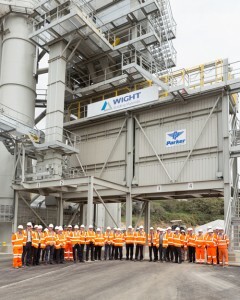 Friday 1 August 2014 saw the official opening of the eagerly awaited new asphalt plant at Blackwater Quarry, St George’s Down, a joint venture between Aggregate Industries and Eurovia. Officially opened by Andrew Turner MP this £3.5 million new state-of-the-art low emissions plant will produce quality, high performance products and innovative long term sustainable solutions for the Island’s public and private highways network for now and the future. Not only will the asphalt produced from this plant service the needs of the 25 year PFI but it will also supply asphalt for a variety of exciting projects across the Island, as we exit the recent recession, providing our important customers with the products they need. And of course, it has allowed us to secure the future of this site and the jobs for employees at St George’s Down. With permission to produce 24/7 if there was a need, the new plant has doubled the hourly capacity of the old plant, so we can look to boost production to catch up on the first year delays to the surfacing works on the PFI and the deliveries to our existing Island customers. Also within the site, there is a recycling facility which will allow us to maximise the use of planings and therefore minimise the use of virgin aggregates within the asphalt and reduce imports on to the island.